An aspect of Lean management that is poorly understood by both management practitioners and academics is the evolution of the “Respect for People” principle in progressive (Lean) management, beginning with the work of Frederick Winslow Taylor. I have written much about this critically important principle over the last 15 years, but my graduate student, Mark Gajewski, has taken this an important step further. 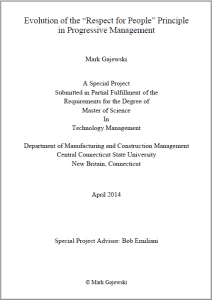 I’d like to share with you a fine paper that Mark has written in partial fulfillment of his Master’s degree requirements in Technology Management. Click on the image to read the paper (.pdf file). Mark currently works as an Engineering Program Manager for a global medical device firm, and has a broad work background in product and process design, quality, manufacturing, operations, and program management in consumer products, automotive and medical device industries. Mark’s interest in Lean management began through his work as a manager whose perspective has been to improve processes and peoples’ capabilities, rather than the traditional “driving results.” In his role as a production manager for a global medical device firm that had previously undergone a Lean transformation, but with subsequent backslide, and while taking my course in Lean leadership (TM572), Mark recognized the importance of the “Respect for People” principle. The paper traces the evolution of the “Respect for People” principle from the early 20th century to the present. The focus is of the paper is people who have demonstrated critical elements of the “Respect for People” principle in actual management practice, through study of original works, to assure facts are obtained from the source as is customary in Lean problem-solving. Importantly, Mark excludes ex post facto analyses by career academics because their interpretation of intent and practice of progressive management is often distorted by their lack of day-to-day and strategic business experience. While it is a fine work of academic scholarship, this paper is entirely practical. In reading it, you will recognize that the “Respect for People” principle is not a recent development. You will learn the limitations of having a technocratic comprehension of Lean, and the critical importance of the “Respect for People” principle in assuring successful, non-zero-sum (win-win) outcomes. You will also learn that despite relentless study, Lean management remains poorly understood by most and has far more to offer than meets the eye. Thank you for sharing this paper, I went through this same program and finished 4 years ago taking several of your classes. Throughout the program, and since graduation, I have learned that progressive management practices are hard to implement correctly for a variety of reasons especially for middle managers. After reading this paper I am reminded that some of the issue is cultural. I worked for several organizations before leaving private sector that did not value their employees beyond what they could produce for the organization. There was no respect for an employee’s potential, their career, or mind. Toyota evolved in ways few Western companies are willing to. Anyways, I try to incorporate the “Respect for People” principles in how I manage my department. You’re welcome. It’s really great that you do that, and heartwarming to see that you are applying what you learned in your MS degree program. In an upcoming post, I will explain why “Respect for People” is so rare in organizations. Respect for our people needs three companions to release and focus their full potential. They are called the 4 R’s. Sadly they are not all central themes in Lean Thinking. The second ‘R’ is ‘Resources’. The third ‘R’ has been largely missed by the lean movement. This is’ Resourcefulness’. Three quotations to clarify and confirm our thinking. “There is no magic method. Rather a total management system is needed to develop human ability to its fullest capacity to enhance fruitfulness and creativity, to utilise facilities and machines well, and eliminate waste.” — “Of course what is important is not the system, but the creativity of human beings”. Taiichi Ohno. — When trying to understand lean and TPS, or anything else, we should always remember Pavlov’s words. “Don’t be a collector of facts. Try to penetrate to the secrets of their occurrence, persistently search for the laws that govern them”.